Before we sat down formally at the table, I wanted my guests to relax with their drinks and nibble on something light. The perfect solution was an amuse bouche, a French terms that means, “to amuse or please the mouth.” This course is meant to be something small to excite the taste buds and offer a glimpse into the chef’s approach to the coming meal. It is a little taste to leave you wanting more. Hmm….what sin goes along with wanting more? Greed. I made exactly thirteen cookies, which meant two per person, plus one left over for the greediest guest to take. The cookies were delicious, and the group eyed each other suspiciously, wondering who would take the last one. The serving dish passed from person to person until Kathy scooped up the last one unrepentantly. However, that was not the only greed on display, as several guests savored every last bit of the balsamic syrup. Politeness was tossed aside for licking of fingers. I loved that my guests were getting into the spirit of the night! These herb and cheese cookies are made with fresh rosemary and Parmesan cheese. Feel free to mix and match the herbs and cheeses. Just make sure that you use a hard cheese, one that can be shredded. 1. Preheat oven to 350 degrees. In a food processor, place flour, rosemary, butter, salt and pepper. Pulse until combined. Add the Parmesan cheese and sour cream. Pulse until the dough comes together. 3. Roll dough out into a log and wrap in plastic wrap. Refrigerate for at least 1 hour. 4. Slice dough into cookies and place them on a lined baking sheet. 5. Bake for 15 minutes, until they just start to brown. 6. Serve with balsamic syrup. 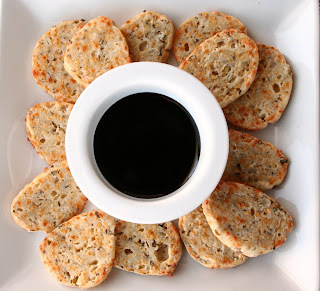 The Herb & Cheese Savory Cookies are wonderful on their own but are amazing when dipped in the balsamic syrup. The balsamic syrup was a revelation; both sweet and tangy in flavor and wonderful with these cookies. I experimented with different types of balsamic vinegars and sweeteners. This was my favorite combination. 1. Combine balsamic vinegar, sugar and honey in a saucepan over medium/low heat. 2. Simmer until reduced by ½ and has the consistency of syrup. 4. Allow the syrup to come to room temperature. You can cover and refrigerate the syrup for up to 2 weeks. 5. Bring the syrup to room temperature before using it. * Note: I used a balsamic syrup infused with fig. 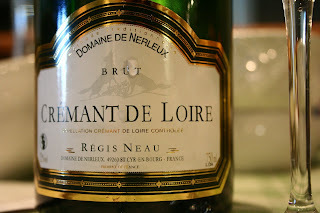 We served these savory cookies with a sparking Crémant de Loire Brut, Domaine de Nerleux Régis Neau. A CONFESSION: One of the guests confessed to enjoying a wonderfully rich and decadent meal while people all over the world are starving. This made us feel bad until we remembered he had just bought himself a luxury car! I love Michael Smith recipes too, I've bookmarked this one! The crackers look fantastic! I love savoury crackers. The balsamic syrup -- all I can say is whoopee! Thanks for sharing. I'm going about your blog, wandering around. Hope you don't mind. Sarah: Michael Smith rocks! I had the pleasure of meeting him a few years ago. He's a giant! Eatingclub: I don't mind at all. Welcome! Lore: Good thing these are easy and quick to prepare. I have never thought to make a savory cookie. What a wonderful idea. I think I will experiment with some different cheeses and try this out soon! Thanks for another great idea! These look delicious! I have a bunch of parmesan that I'd love to use in these! Just discovered your blog. Love the dinner party theme...the cookies look fantastic and I can't wait to try the balsamic syrup! I am absolutely loving your themed party! My grandmother is the queen of themed parties and october just happens to be both our favorite months! I loved this idea and how well you thought everything out. Wonderful! Just finished baking, made the syrup, can't wait to try. If they are good everyone gets them for Christmas. I just made these last weekend and all I can say is...YUM! I am so making these for a bake sale...people love savory stuff. YUM.